A great way to celebrate an anniversary. It's well-priced, nicely built and you get two more frets! Excellent build. Accessible and playable neck. Great Gibson tones. 24-fret not to everyone's taste. The black finish is basically gorgeous. The outline is beautifully scultured, with very pointy horns. The 50th Anniversary decal on the headstock isn't over-intrusive, visually. The extra frets don't add anything to the SG's neck, only the fingerboard. The hardware is of very high quality. Unlike the original SGs, this guitar is put together using Titebond 50 resin. The tone is naturally focused, even without distortion. Were this SG the only model to celebrate its 50th anniversary, Gibson would have received a torrent of complaints. Vintage diehards would have wanted a detail perfect replica of the 1961 original, while others might have encouraged Gibson to make something new that reflected its more than 100 years of guitar-building history. But thankfully, the 50th Anniversary Standard 24 is the first of a monthly run of new models that raise a glass to this great design. So instead of a robot-tuned carbon fibre machine or a clone of the first SG that Ted McCarty ever held, we have a staid and sensible (if SGs are ever sensible)-looking variant with a tweak or two. "The neck pickup delivers a supremely smooth and articulate sound that doesn't require much drive to sing." The clue for the first and most obvious of these is in the name - Standard 24. Gibson has chosen to extend the SG's already very accessible neck by two frets, at a time when two-octave 'boards can hardly be described as 'all the rage'. Still, PRS does pretty well with them and the metal fraternity are always after a fret or two extra - especially in this moody ebony finish. Thankfully Gibson hasn't extended the neck outwards to accommodate the extra wires; instead they've simply filled the gap that used to be covered by a plastic plate on the original Les Paul SGs. This could also improve on-strap balance and strengthen the neck-to-body joint, the extra 'board adding mass and rigidity - we'll see. Unlike original SGs, which were put together using animal glue, modern Gibsons use fast-setting Titebond 50, an aliphatic resin that provides excellent 'grab' during fitting of neck to body, and better heat and moisture resistance over time. Gibson also now uses the Plek system to set up its guitars and cut the nut's slots with supreme accuracy. The nut itself is made from slick and hard material from DuPont called Corian (which is also used for high- class kitchen worktops). One thing we love about this particular guitar is its beautifully sculpted outline, with heavy chamfering all round and the very devilish horns. Perhaps it's the slimming nature of black playing tricks on our eyes, but these must be the pointiest horns we've yet to see on any SG! The species of mahogany for body and neck isn't specified, but is probably South American. Likewise the fingerboard - it's rosewood and that's all we know. A pair of Gibson's '57 Classic PAF-style pickups powers the Standard 24. Twin 300K linear potentiometers control each pickup's individual volume, while 500K logarithmic pots govern tone. A Switchcraft three-way toggle takes care of pickup selection duties. Workmanship and finish on the Standard 24 is very high. Nitro-cellulose over black is a notoriously difficult finish to do well, but here it's virtually perfect, with the right amount of grain sinking giving away the finish's thin cellulose nature. Playability has never been an issue with SGs. Their usual 22-fret playground joins the body at the final fret, so is completely revealed, giving unfettered access to the very top. Should you really want to play a top E, or even bend it to F#, getting to the two additional frets is a bit of a squash, although access to the 22nd remains as comfortable as ever. The 24's neck offers a pleasing playing experience. Gibson describes it as 'rounded' and it is indeed the perfect palm filler. SGs always offer a feeling of playing freedom, and this one's excellent set-up highlights that sense of liberty. At the 12th fret on a Les Paul you feel you're running out of neck, yet here there's oceans to spare. All the usual blues-rock staples are catered for on the perfectly dressed frets; choke-free bends, squeezable vibrato and slippery slides all seem effortless. In fact you feel like you've known the guitar for years. On a strap it does sit well too, so perhaps those two extra frets have improved the balance. While Les Pauls, ES-335s and SGs have always used essentially the same drive-train of twin humbuckers, two tones, two volumes and a three-way selector, their construction imbues each model with its own sonic footprint. As you may imagine, the SG's solid body, but lighter build, sits it somewhere in the middle. Think of famous SG players' tones and there's always an extra 'snap' there compared to a Les Paul and a bit more thickness in the treble compared to an ES-335. Our 50th Anniversary model doesn't disappoint us in this regard. These '57 Classics are vintage-voiced, but not over-powered. There's plenty of beefy grunt from the bridge unit when cranked, but the neck delivers a supremely smooth and articulate sound that doesn't require much drive to sing out sweetly. Both deal with distortion very well - we tried the guitar with a Dumble-style Zenkudo pedal and the two were a match made in heaven. The SG's naturally focused tone breathes and manages to speak without the need for outlandish distortion. In fact, it does that Beatles Revolver sound better than almost anything. Should you require clean and spanky, the middle position will do a surprisingly good 'funk meets country' sound that's great for arpeggiating chords orplaying triad stabs higher up the guitar's neck. Overall it's a great-sounding machine that's probably way more versatile than most SG lovers would ever require. As this review's opening gambit stated, if the Standard 24 was to be Gibson's only anniversary SG then it would surely have come as a disappointment to modernists and vintage nerds alike. But as it's only the first in a series, we can happily report that this particular 50th Anniversary SG is a success. 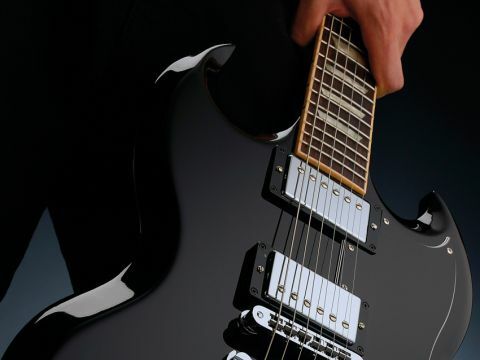 Its dark and aggressive looks are bound to appeal to the heavier end of the rock market and it's precisely these technically able players that go for two-octave guitars - even though they bemuse most of us at Guitarist. It's not badly priced either. While its fretboard length isn't for everyone, we can't deny the quality inherent here. Everything about the Standard 24 is well done: fabulous finish, great set-up and all the tone you could want - not to mention as much attitude as any electric guitar around. At first we weren't sure we were going to like it, and yet now we tip our hat to a job well done - we can't wait to see what other SG delights Gibson has up its sleeve this year.